As a method of treating the sludge produced by Wastewater Treatment Plants. By “Wastewater Treatment” we are referring to water treatment in the “foul sewage wastewater treatment” and “industrial effluent treatment” industries. 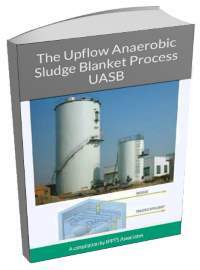 The Upward Flow Anaerobic Sludge Blanket or UASB process is a specialist use of anaerobic digestion wastewater treatment. It is quite rare to see, and it is based upon the idea that the particles in any sludge are gradually falling within the liquid they are in. By creating a tank which is cone shaped, resting with the apex of the cone at the bottom, the water requiring treatment is introduced at the bottom. From there it flows constantly upward, very slowly. The flow rate is then balanced with the geometry of the tank so that a “blanket” of sludge, which is particles of organic matter and bacteria constantly falling gently in the water at the same speed as the water rises, stays perpetually suspended. 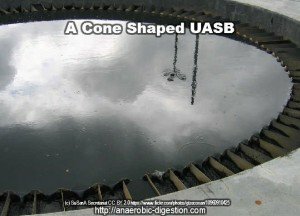 In effect it is balanced in a horizontal layer, above the bottom, within the UASB reactor vessel while the micro-organisms digest it. The extent to which the blanket is truly anaerobic can be questionable. The process was originally intended just as a high quality water treatment method. It is not known to the author how reliably this process can be used to produce a good biogas yield. However, it is a clever way in which to create a process in which the particles which digest slowly, would tend to reside in the reaction area/ sludge blanket. Individual particles can stay as long as needed, until they are eaten by the bacteria. 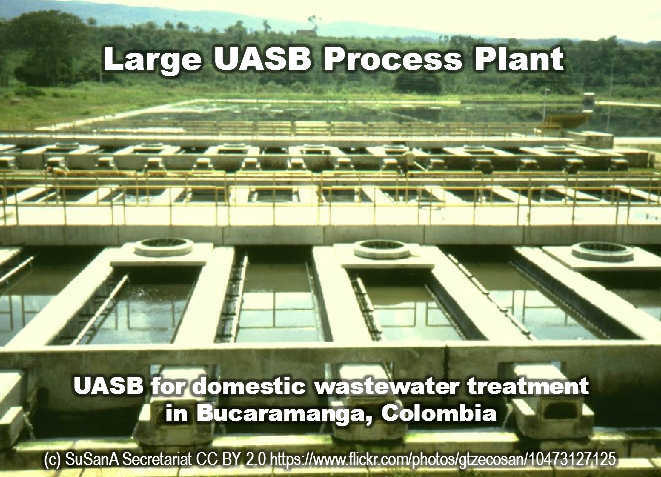 For this reason the author assumes that there will be very little excess sludge created in UASBs. 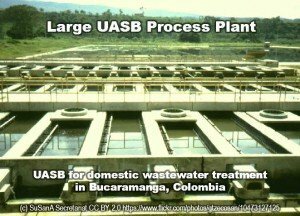 This reduces the problem of sludge disposal, and certainly reduces the cost of disposal of excess sludge remaining at the end of digestion. Sludge disposal can be expensive in other anaerobic digestion processes, especially where the material contains pollutants. Download our free book! Click on the image to get it! (iii) gases of decomposition like methane (CH4), carbon dioxide (CO2), nitrogen (N2) etc produced by microbial digestion. The digested sludge is de-watered, dried up and used as sewage sludge fertilizer while the gases produced are used as fuel or for driving gas engines. The supernatant liquor is re-treated at the treatment plant along with the raw sewage. The tanks in which sludge digestion is carried out are called sludge digestion tanks. 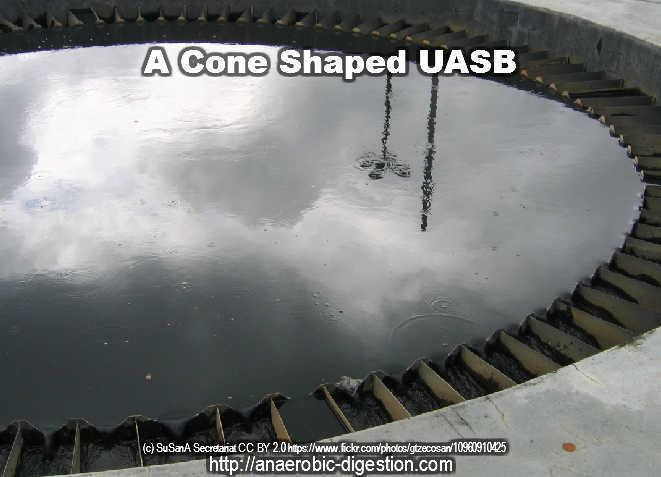 Three stages are known to occur in the biological action involved in the process of digestion of sludge for anaerobic digestion wastewater treatment. These are (1) acidification (2) lysis/ liquefaction or a period of acid digestion and (3) gasification or conversion of acids into methane and carbon dioxide. As the fresh sewage-sludge begins to decompose anaerobically, bacteria attacks easily available food substances such as carbohydrates (sugars, starches, and cellulose) and soluble nitrogenous compounds. The products of decomposition are acid carbonates, organic acids with gases as carbon dioxide and hydrogen sulfide. Intensive acid production lowers pH value to less than 6. Highly putrefactive odors are evolved. In this stage, the organic acids and nitrogenous compounds of the first stage are liquefied i.e., transformed from large solid particles to either a soluble or finely dissolved form. The process is brought about by hydrolysis using extra cellular enzymes. It is during this period, that the intermediate products of fermentation in other words, acid carbonates and ammonia compounds, accumulate and the resulting gasification into H2 and CO2 is at a minimum. The pH value rises a little to about 6.8, odor is extremely offensive and the decomposing sludge entraps gases of decomposition, becomes foam and rises to the surface to form scum. This stage is known to last much longer than the proceeding stage of acidification and hence also termed as acid regression. It is the stage when more resistant materials like proteins and organic acids are broken up. Large volumes of methane gas of high calorific value, along with comparatively smaller volumes of carbon dioxide are evolved. The pH value goes to the alkaline range i.e., above 7 and a tarry odour appears. Gasification finally becomes very slow; the sludge becomes well adjusted and is stable enough for disposal. This stage in the digestion of sludge is also termed as alkaline fermentation. The remaining sewage sludge after digestion can be disposed of sustainably, and without the heavy metals and other substance it may contain causing the problems which can occur when it is spread on land. This is done by a process known as “pyrolysis and/ or gasification”. There are also, other benefits other than economic. In fact, wastewater treatment facilities are an ideal place to increase the diversion of food waste, when there is an anaerobic digestion facility available. energy avoidance due to methane production. The excess energy can be sold back to the grid for profit. via USEPA. I am grateful for your info as I study the Waste for Diploma. Really thank you! I enjoy reading it. I learn much more on this subject.. Thanks for the sake the me this marvellous post.. Anyway, I am gonna subscribe to your silage and I wish you post once again soon. I’m excited to discover this site. For once here is someone who appreciates that anaerobic digestion (AD) and biogas are not synonymous. Not all AD plants are “biogas” plants. OK. They may produce biogas, of course they will! But, in the anaerobic digestion plant where I work this plant is actually run to clean-up the water. So please stop calling these types of AD plants biogas plants. Broderie – Yes. We can see where you are coming from on this. It is a good point. “Anaerobic digestion plants” and “biogas plants” are not all the same. Some are for the purpose of making biogas, others for other purposes, so we should take care not to call them all BIOGAS PLANTS? I don’t think we’ve made that mistake on this page, but it is very likely that we have elsewhere in some articles. We will take more care in future. Thanks for sharing, this is a useful post. No longer am I puzzled about these green energy methods. Awesome article post. Green energy this way using WASTE is good for the environment I am sure. Looking forward to read more. Much obliged. Mando – Yes. I see that you have created a good Pinterest page with a selection of small domestic biogas plants for warm climates, which are mostly buried below the ground. Why stop at 14 images though? This is FAKE science. Sludge is mud. Doesn’t matter what you do with mud, it will still be mud. We wanted to just grab a publication on this subject from our local biogas group. However I do think I found out much more from this blog post. I’m extremely delighted to see such stunning information being shared easily out there. The biogas is making the money to pay the water cleaning cost. This is very good. We need this.